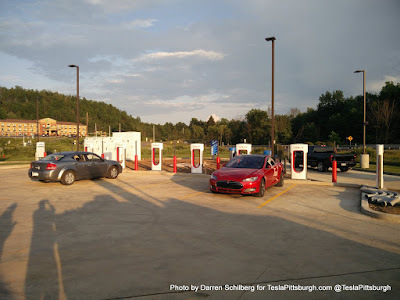 TeslaPittsburgh.com: DuBois / Falls Creek Supercharger CONFIRMED! 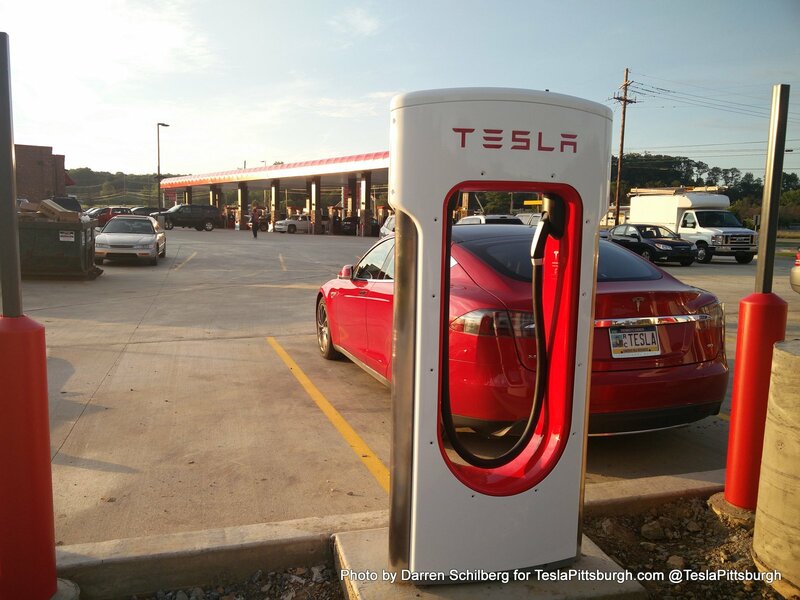 DuBois / Falls Creek Supercharger CONFIRMED! Darren and Joseph are no strangers to this blog. You might remember them from the series we did on the Light Harmonic Speaker Upgrade. 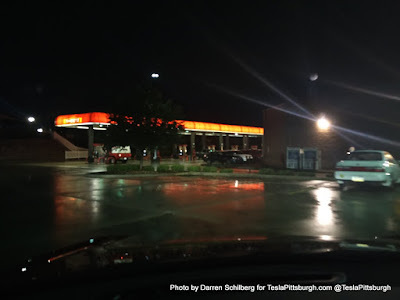 Darren and I have also spent some quality time at Sheetz while reviewing dash cameras (which I never got around to reposting here with extras... ah, the never-ending to-do list!) 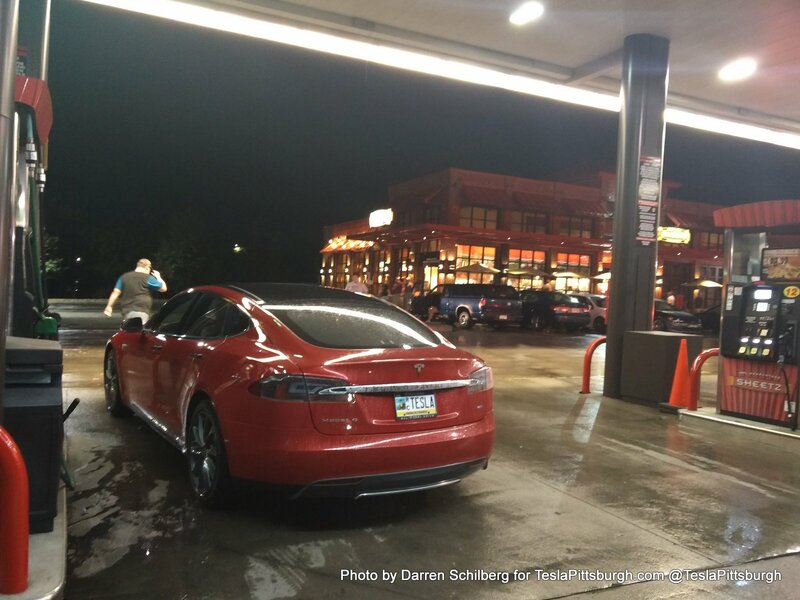 Adding to his credentials, Darren was also our area's first envoy to scout out the Erie Supercharger in person. 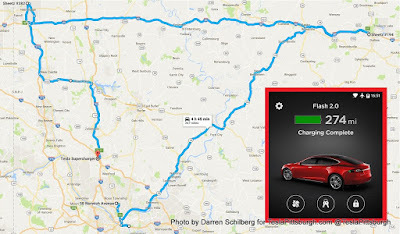 With Darren's 90D fully charged and showing 274 miles of rated range, they planned a route that would take them direct to the DuBois area, where we believed Tesla's "Coming Soon" pin indicated that the Falls Creek Supercharger was already under construction. 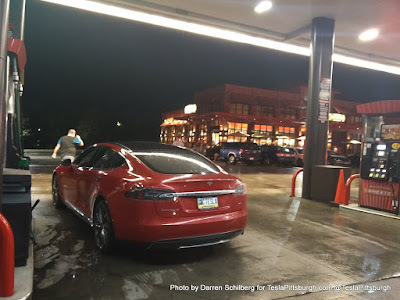 The return trip would include more scouting of two other Sheetz locations that are nearest another "Coming Soon" pin on the Tesla Find Me page that is labeled as West Middlesex. 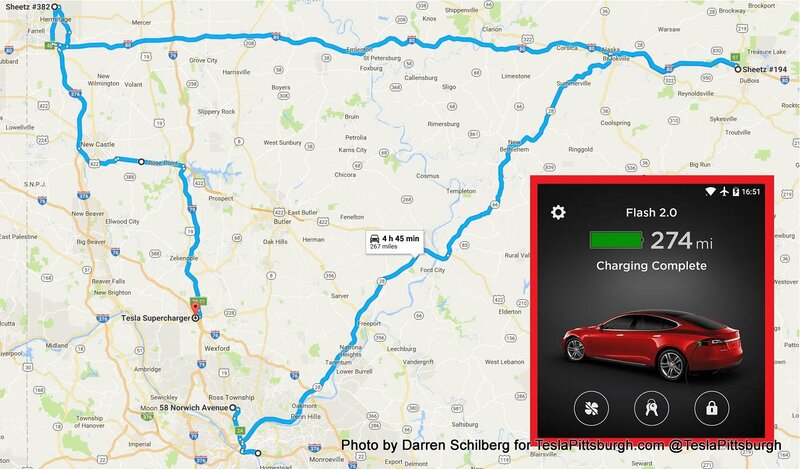 The total route was expected to be about 267 miles. 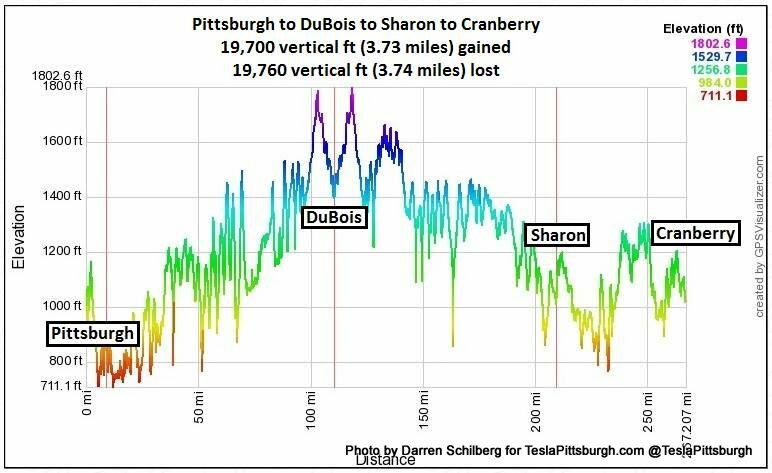 Simple math would say that 274 miles of range is sufficient to go 267 miles, but elevation would be a significant factor on the route. In fact, the highest point on I-80, east of the Mississippi River, is about 30 miles farther east where the interstate passes through SB Elliot State Park. Climbing and descending the rolling hills toward Falls Creek, the team watched the car's estimates vary wildly. 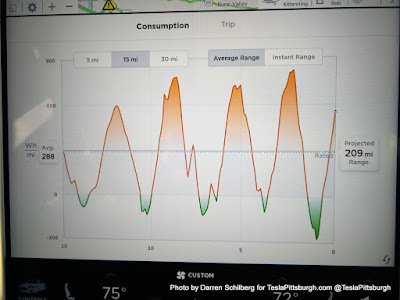 "It is definitely possible to do it all at the speed limit but it is still best to drive 2-3 mph below the speed limit until the Trip graph estimates you will arrive at your destination with >10% range remaining and then you can speed up to the speed limit or maybe a little faster," wrote Darren. The complicating factor here, of course, was that this Supercharger would not be operational even if it existed. Fortunately, just as the destination neared... a regen gold mine was waiting for them. 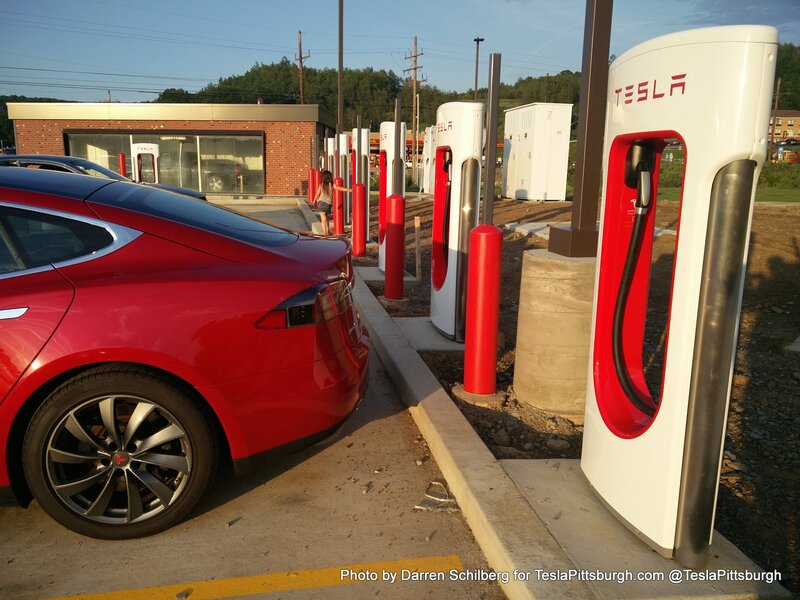 "It was exciting to get 282 Wh/mi while going up 800 ft in elevation on the 100 miles from Pittsburgh to DuBois-- which included a quick drop of 400 ft to reach the chargers in DuBois," wrote Darren to our Facebook Group. 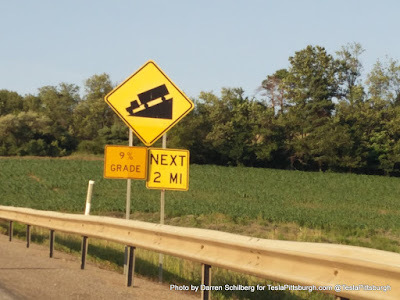 "On the "9% downhill grade" sign I think I let out an audible "YEE-HAW.". Arriving at the Falls Creek Sheetz station, Darren and Joseph found the Supercharger nearly complete! "There are 8 chargers here and 1 of them is a front-in spot (in case someone has a bike rack or is towing a trailer). A Car Wash is 20 ft away but more importantly the window squeegees are just a few dozen feet away," wrote Darren. 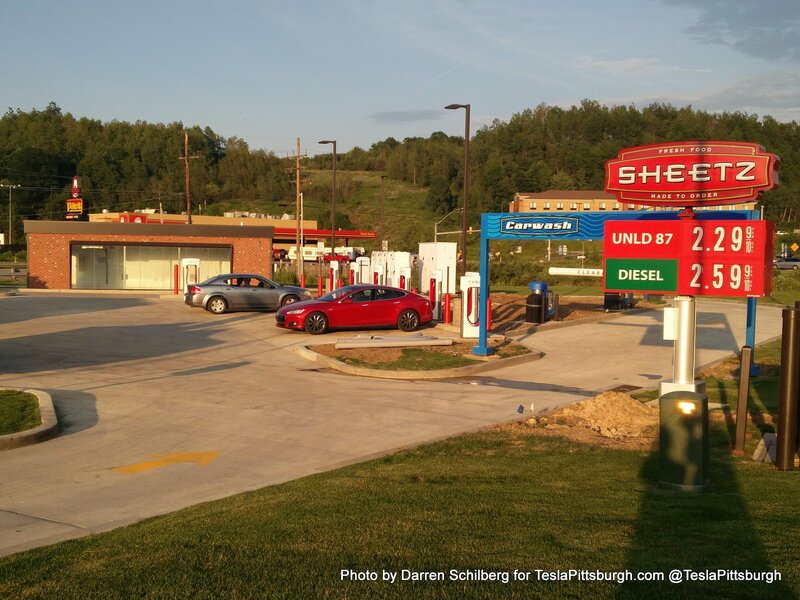 Tesla's growing partnership with Sheetz has suddenly been very fruitful, with other locations in Breezewood, Maryland and West Virginia all simultaneously under construction. There's still an as-yet undiscovered "Coming Soon" pin near State College/Bellefonte, so we'll have to see if that partnership yields more Superchargers there too. 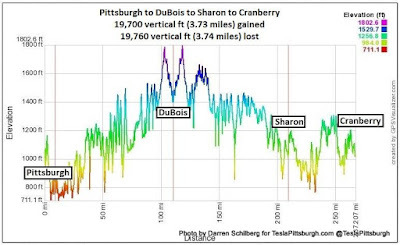 As it stands once Falls Creek becomes operational, the span from Macedonia, Ohio will be about 160 miles and Bloomsburg will be about 140 miles the other direction. 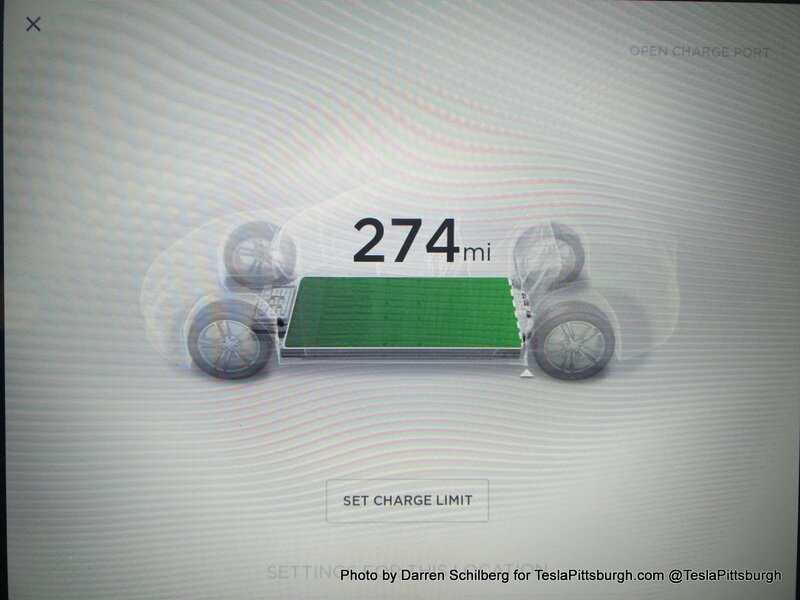 That's a very manageable distance for every model of Tesla currently on the market. 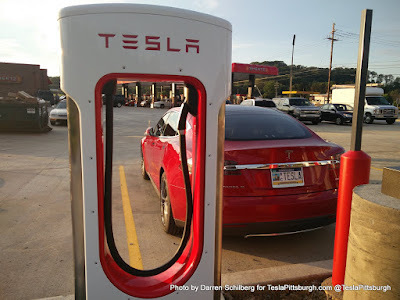 Adding Superchargers to Bellefonte would halve the distance to the east. West Middlesex Superchargers would cleave the trip to Ohio in about half as well, with 100 miles from Falls Creek and then another 60 miles to Macedonia. 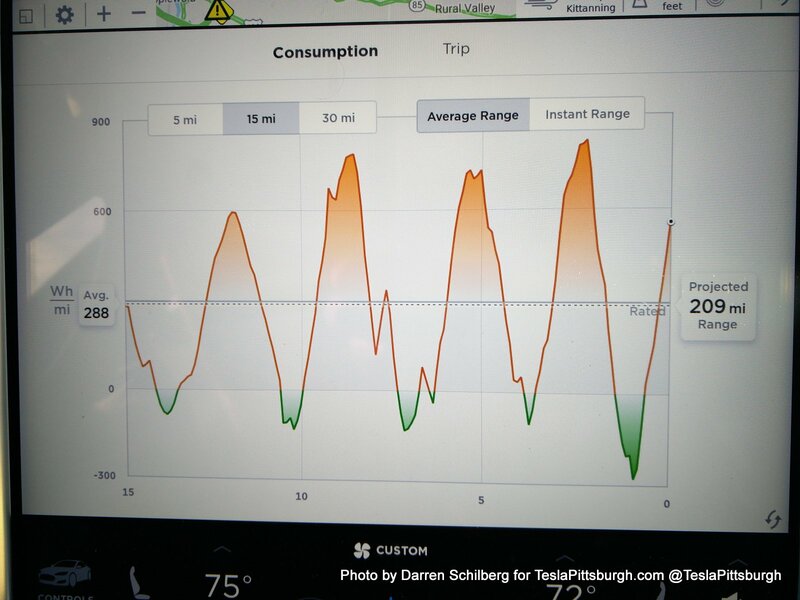 Whenever you drive a Tesla in an area that hasn't had a lot of Tesla traffic yet, it's like a time warp for those of us living in areas where they've become more commonplace. You start getting the curious looks, thumbs up and questions... and next thing you know, you're spending "Tesla Time" just like in the early years! "The ICE car in the background is perfectly fine there as the chargers are not yet operational, so these are still just normal parking spaces (the "Tesla charging" parking signs haven't even been installed)," wrote Darren. "The owner of that car and another person stopped by after we parked and remarked that they had never seen a Tesla in person until now so, we took the opportunity to show them the empty Frunk, give a brief overview of it, and they took some selfies with the car." With storms looming in the distance, Darren and Joseph retreated back into the car and headed a hundred miles to the west. There was still a little scouting left to do. 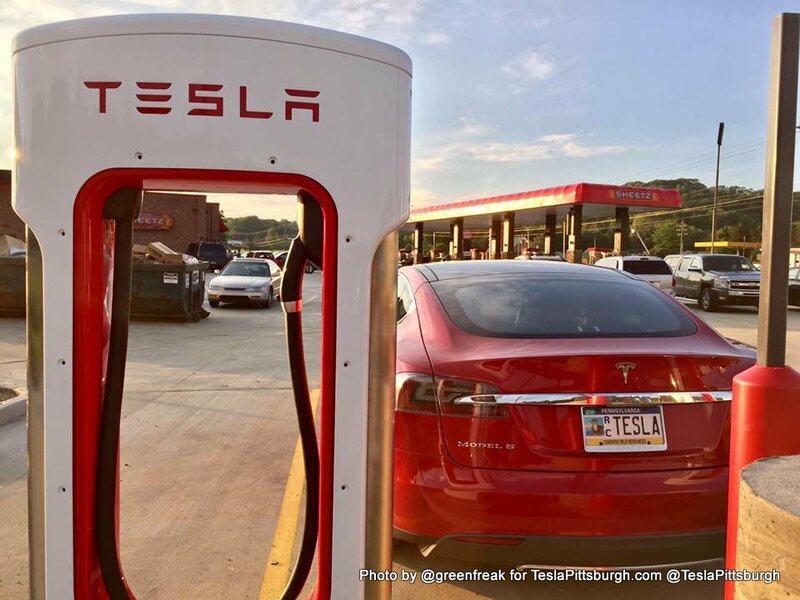 After all, the contractors that install Superchargers are known to hop from one location to the next-- constantly building-- as the network expands. The first location near West Middlesex offered up no sign or clue that construction was coming, though it does have a nice little area of the parking lot that would be perfect. Checking out the second location, a particularly large and newer Sheetz, our explorers again found no sign that Tesla Superchargers were coming. 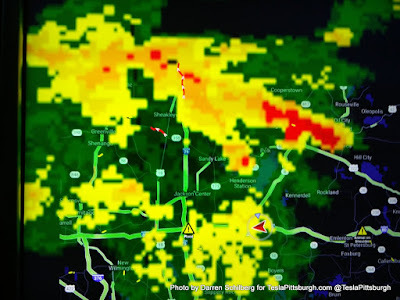 Luckily they did find a place to park out of the rain... before again turning the car to another compass point and making the final drive south back toward Pittsburgh. We can only hope that the construction crew instead headed east to the as-yet-undiscovered State College/Bellefonte location. Arriving back at the Cranberry Supercharger, they'd made the drive with just enough range to spare. 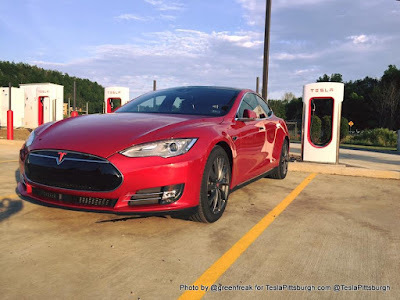 "Starting with 274 miles of range, we drove 270 miles of mostly interstate and cruised at the speed limit with the A/C on about fan speed 5 and endured a bit of rain. 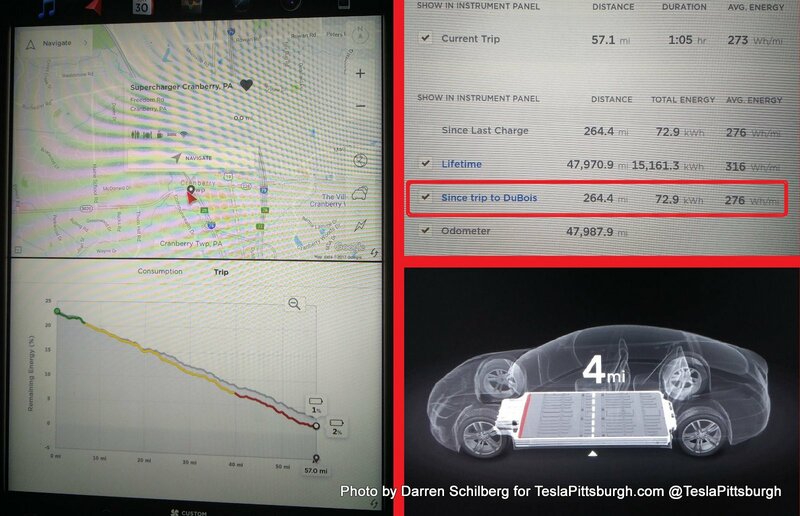 We arrived at the initial destination (Cranberry) with 2% charge or 4 miles remaining," wrote Darren. 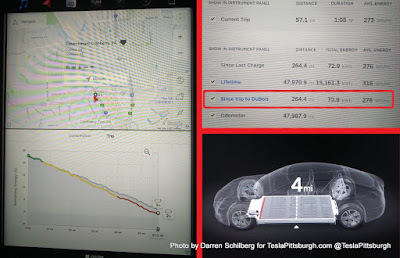 Darren posted the final trip statistics to our group page, including a breakdown of Wh/mile for each leg of the journey. 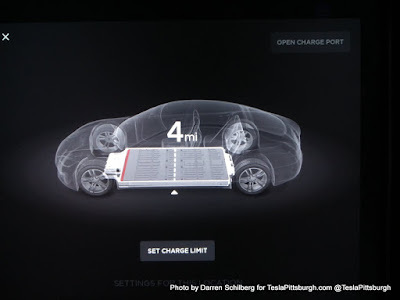 If I've helped you make the leap to Tesla, please message me so I can answer your questions.